Need a website for your business? 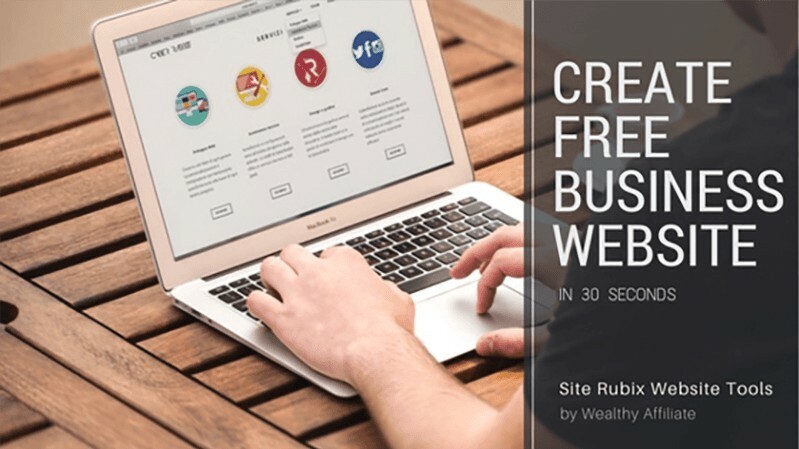 If you use the website creation tools that I use, you will learn how to create a business website for free, in 30 seconds. The website will be built on WordPress and can be easily used for any business design style you choose. Creating a website does not have to be difficult. However, this task can seem difficult with some website hosting companies. Before you can create a website, you need to choose a good website hosting company. When you research web hosting companies, you will be presented with a ton of different options for storage space, Cpanel account control management, database management and more. These website hosting features certainly have a place within web development but can be overwhelming, technical and hard to understand. Usually, these features are important for advanced web developers who you would pay to build your website for you. If you just want a simple way to create your own website, there is a simple way with Wealthy Affiliate. You can bypass all of the decisions and literally just create a website. And it is free. So let me show you. Here is how to create a business website for free in 30 seconds. 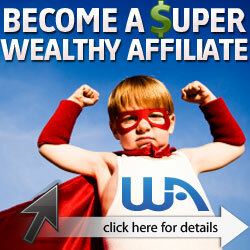 If you are not a member of Wealthy Affiliate, you will need to sign up for an account. But don’t worry. Wealthy Affiliate has a free plan. When you sign up for the first time, you will automatically be signed up for the free starter plan. You can always upgrade to premium if you decide you like what you see and want more features. But you do not need to pay anything to follow these steps and build a new website for your business. Once you are signed into Wealthy Affiliate, you will presented with a variety of things you can do. To build your website, you will go to Websites. You will find Websites on the left hand side of your screen. Websites is referred to as Site Rubix, a full suite of website development tools within Wealthy Affiliate. It is literally the place where you build and manage one website or many websites. Inside Websites alone, you will be presented with a variety of website development tools and options. To create your first website in Wealthy Affiliate, you will choose Site Builder. Site Builder is the tool designed specially for creating new websites. Once you are in Site Builder, you will be guided through the flow of creating your website. 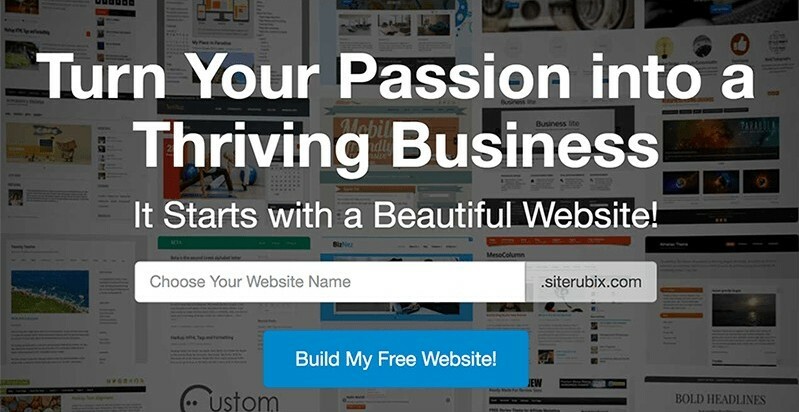 The on a free domain option will build your website domain like this: mybusinesswebsite.siterubix.com. You likely already have a business name for your company. So you will enter in your business name into the domain name box. A domain name is the branded website address you give to people to promote your business. You cannot change the name once you’ve created it. You can always delete the site and create a new one with a different name, but domain names are not editable. So just make sure you enter in a website domain name you want to use going forward. You don’t include spaces here. Websites cannot have spaces in them because it messes up your web browser. Web browsers will stop reading your website code at spaces which will stop the loading of your web pages. If you want visual spaces between words, use characters such as a hyhen (-) or a underscore ( _ ). However, most large brands do not use characters between words. They just string their words together. And that is perfectly acceptable because you can give your website a more appropriate name title in the next step. The website title is the name title of your website. A website title appears in your browser window tabs and within search engine results when your website appears. The good news is that your website title name can be different than your domain name. And you can change the title at anytime. A website title name is not set in stone like the domain name. So don’t sweat this part too much. Describe what your website is about within 55 words or less. You want to keep character count in mind because there is limited width space for the titles to appear. Here is where you choose the layout design for your website. This is how your website will look to everyone who views your site. A website theme is the design and content layout template for a website. You can choose from 12 professional theme designs within the free account. All of these themes are pre-designed templates and free to use. Scroll through all of the options and choose style that you like the most. The good news is you can change your theme anytime. And it’s very easy to do. Also, many themes give you different color options. So don’t let colors prevent you from using a theme with a layout you like. This is the last step! When you click the green button, your business website will be created! Your business website is now created. This is the time to add content to your website. Tell the world what you want them to know about! 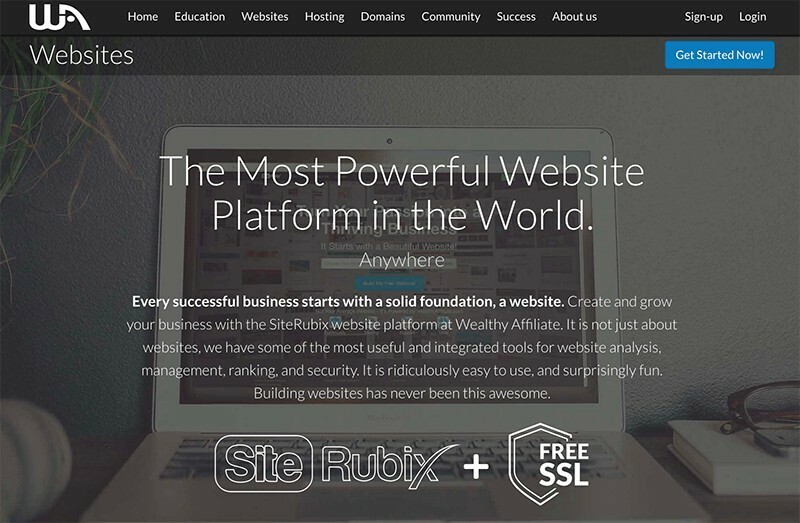 This video training will give you an in depth look at creating a website within Wealthy Affiliate’s Site Rubix website management tools. You’ll be taken to Wealthy Affiliate to watch this video. If you are not a member, simply sign up for free account. You will be able to this training video along with many more. Ready to Create Your Own Free Business Website? Click the image or button below to start creating a website for your business. You will be guided through the steps as listed above. When you first start creating your website, you are presented with a couple of options on how to setup your website domain name. For this tutorial, I have you start with the on a free domain option. This option is free, quick and easy. However, I do want to explain the other on a domain I own option. This option requires a paid cost to purchase a custom domain name and the premium membership plan. Your website name will look like this: mybusinessname.com. The on a free domain option is completely free. It does not even require a credit card. And never expires. This free option from Wealthy Affiliate is no different than creating a free website on Blogger. Or WordPress.com. When creating a website for your business, you want to be as professional as possible. And professionalism is what can set you apart from other competitive businesses targeting your same customers. It is ok to start out with the free website with these extra words in your website name. However, this strategy is not recommended for long term. Short term, you learn how to create a business website. And you actually build with a just a few steps. Long term, you work towards a paid website option so you can remove those extra words in the your website name. You want a website name that is easy to remember. Easy to type. The longer the website name, the harder it is to remember. Enter in your business name below. You will be guided through the steps listed above. Leave your questions below. I’d love to connect with you. 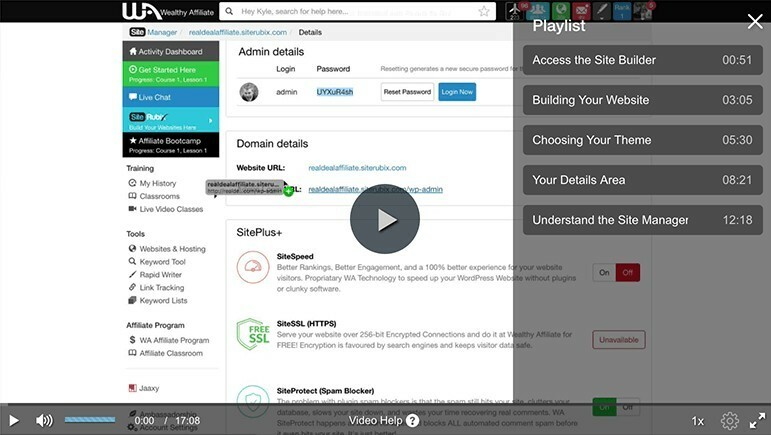 This is a very clear walk-through of how anybody can quickly and easily create a free blog. I thought your comparison of a Site Rubix sub-domain with Blogger and WordPress was very neat. I host my blogs with Site Rubix and I like the way Site Rubix makes it easy for us to start a free blog as a sub-domain of siterubix and then convert it into a blog on our own domain if we want to. The Wealthy Affiliate training videos and lessons are excellent, by the way. People really can join as complete beginners and learn step-by-step to blog like pros. Thanks for stopping by. I’m glad to see you are using Site Rubix tools too! Site Rubix and Wealthy Affiliate are definitely my favorite digital marketing tools, yet. We have everything we need to learn, execute and grow. And you are right, these tools were created to help anyone, even beginners, to learn step by step like the pros. Great point. And this is definitely true. Over are my days of learning how to build websites on Udemy and managing my websites on a hosting provider like HostGator. And then trying to connect with other creative folks and bloggers on some other community site. I love that my tools, training and community are all in one place. I really like the way you have simplified the process of building a website here. I have tried using other tools and it was really terrible for me, especially with the themes. I see there are free themes within this builder. Is there anytime that will come when I will have to pay for them? I have experienced this in the past. Per the free themes, great question. With the free starter plan, there are 12 free design themes included for your business website. And you do not have to pay any additional cost for those themes. 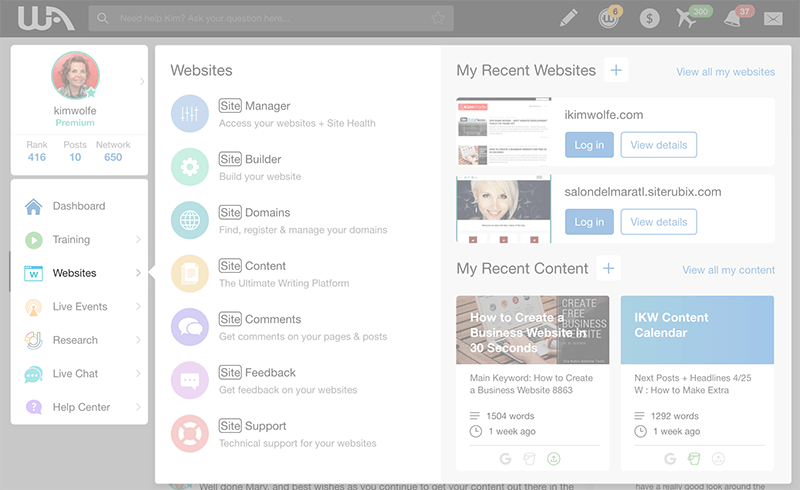 In most cases, each theme design will have options to upgrade the theme with more features. However, these upgrades are not required to create a business website. The free themes have basic functionality to add content to your website and style it with basic options. The paid themes will give you more features and more customization features. But starting out, those are not needed. And if you ended up upgrading to a paid premium plan, you’ll get access to 3,000 designs. Once again with options to buy upgrades to the design but not required to get started. Hi Kim! Wow, that’s such an informative run-through of WA. I’ve been a member of Wealthy Affiliate for a few months now, and I love it! I’m so grateful for everything that platform has taught me. I hope more people out there give it a chance. Out of curiosity, how long have you been with Wealthy Affiliate for? Thanks for chiming in here. I’ve been with Wealthy Affiliate for 7 months now. I completely agree with you. Wealthy Affiliate is really a unique and inspiring place. All I gave it my best shot, it’s one of those places you just need to experience for yourself. This is an excellent guide for beginners to figure out on how to create a website in 30 seconds and I can vouch for this. I’ve hosted my blogs on this platform and it is so simple to use. All the training and information are there for us to absorb. If anyone is having second thoughts on this, all you need to do is to take action and stick with it. Thanks for stopping by. Glad you have found success with your websites with Wealthy Affiliate website site management tools. I’ve used other website builders and hosting providers. Wealthy Affiliate makes it really easy to launch a new website and learn digital marketing skills of how to drive traffic to it. Being a member of wa myself, I can say for certain that it really does take only 30 seconds to create a fully functional website that I’m return can make you a lot of money. I remember I had to do it the old way uploading files and other things which was way more confusing, and took about 20-30 minutes if not longer. I love how now I can get my website up and going, then start working on it right away. I remember those days too Michael. We’re talking the days of Adobe Dreamweaver. Seems ancient when compared to WP and how you had to manually upload your websites to hosting servers.